la-de-da cultivates betterment through the performing arts. 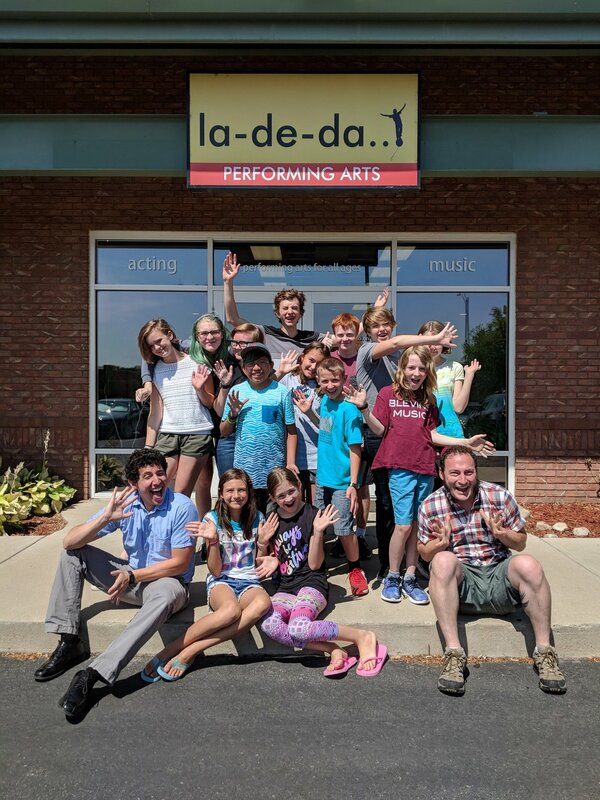 La-De-Da Performing Arts is a theatrical training school for all ages and all levels. We offer classes and camps year round for preschoolers to adults; offering all things theatre from improv to musical theatre. Our teachers love what they do – act, sing, write, create, laugh, play, compose, build and listen. We believe the life lessons gained through the performing arts serve us our on journey to being empowered, passionate, collaborative, and empathetic students of life. We believe in skill-building. We do exercises and scene work designed to introduce and improve skills and technique. Our end-of-session performances focus on the work of the actor. Our minimalist approach (no large sets, props or costumes) help students learn to depend on their own instrument (mind, body, voice) in theatrical storytelling. We believe in age-appropriate work. Our scripts and songs are original and written specifically for kids. For the adult student, we choose challenging, award-winning, quality scripts from published authors. We believe in providing opportunities for all ages K-12, college and adults all year-round. Our school-year classes are 5 to 9 week sessions addressing fundamentals of singing and acting for each age group. Our summer intensives offer shorter sessions with more intense, specific learning - summer camps with a final play performance for kids; topic-focused summer workshops for adults. We believe in teachers who do. Our instructors all have degrees in the field and are all working professionals who regularly perform in local and national productions. We also bring in guest specialists to augment learning and provide professional development for practicing performers. Everyone is welcome to try one class of a session (no obligation, full tuition due if continuing) to see if La-De-Da is the place for them. We know it will be. See below for cancellation and other policies. Summer Camps are Filling - SIGN UP NOW!